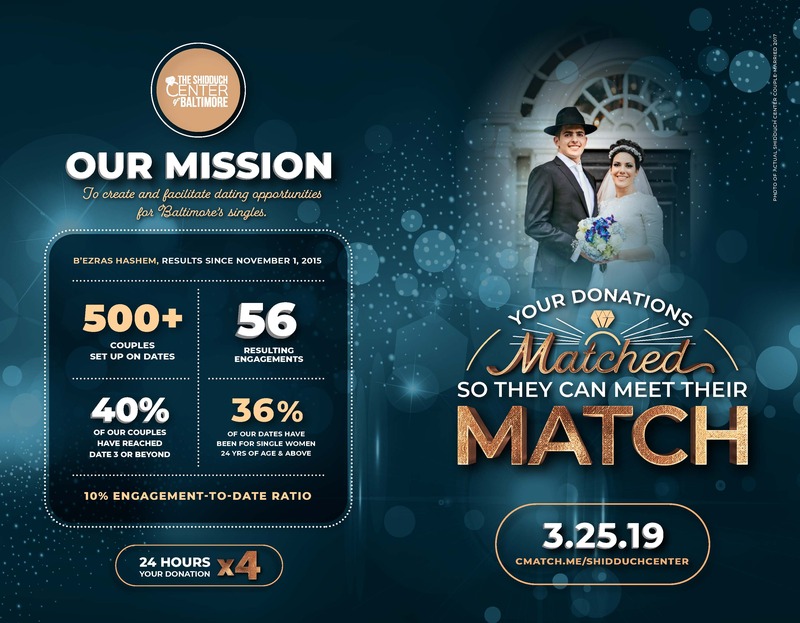 Yated Shidduch Forum 3/29/19: Is it Important to Share in Shabbos Meals During Engagement? We spent some time with The Shidduch Center of Baltimore’s Executive Director, Shlomo Goldberger, to learn more about the The Shidduch Center, and the profound impact it is having on our community. Yated Shidduch Forum 3/22/19: How Can We Ensure That Our Shidduch Suggestions Are On Target? Yated Shidduch Forum 3/8/19: Waiting for Months to Get a Date. What Can We Do? Yated Shidduch Forum 3/1/19: We Already Gave a Yes. Can We Change Our Minds? Yated Shidduch Forum 2/22/19: Do I Really Need a New Hat for My Wedding? Shidduch Center Dedicated Shadchanim: What are they doing & Why are they so important? Yated Shidduch Forum 2/15/19: Single Men v. Single Women – Who Has It Easier In Shidduchim? Yated Shidduch Forum 2/8/19: Date 1 Was “DOA,” Should I Still Go On A Date 2? Yated Shidduch Forum 2/1/19: Traveling Out of Town for a Date, How Long Should I Stay? Question: In the past, proper spacing between dates has been discussed. I will iy”H be traveling by plane to date someone out-of-town. Should I be waiting around several days in a city I am not familiar with before I go on the next date? Would you advise me any differently than if I was dating in-town? Yated Shidduch Forum 1/25/19: Did He Call Too Soon? Yated Shidduch Forum 1/18/19: How Should I Ask Questions on a Date? Yated Shidduch Forum 1/11/19: Day Dates or Night Dates, Which One is Better? Yated Shidduch Forum 1/4/19: Is it Acceptable to Redd a Shidduch Via Text Message? Yated Shidduch Forum 12/28/18: Should We Tell a Shadchan Up Front How Much We Can Afford for Shadchanus? Yated Shidduch Forum 12/21/18: Will Skipping Learning In Eretz Yisroel Harm My Shidduch Prospects? Yated Shidduch Forum 12/14/18: How Can I Get Better at Making Shidduchim? Yated Shidduch Forum 12/7/18: Red Flags on a Date, Should I Say Something? Yated Shidduch Forum 11/23/18: Can Better Dating Practices Help Reduce Divorce Rates? Yated Shidduch Forum 11/16/18: Will Skipping Seminary Harm My Shidduch Prospects? Yated Shidduch Forum 11/9/18: My Future Father-In-Law Is Anti-Vaccinations. What Now? Yated Shidduch Forum 11/2/18: Do You Want to See My Bracelet? Yated Shidduch Forum 10/26/18: Giving a “Yes” to More Than One Suggestion at the Same Time? Yated Shidduch Forum 10/12/18: Hung Up On Yichus? Yated Shidduch Forum 9/21/18: Am I Leading Him On If I Say Yes? Yated Shidduch Forum 8/31/18: He Slipped Off His Shoes on a Date; Deal Breaker? Yated Shidduch Forum 8/24/18: How to Confirm Financial Support? Yated Shidduch Forum 8/10/18: What to do When Younger Siblings Protest a Shidduch Idea? Yated Shidduch Forum 7/27/18: Who Should Be The Shadchan? Yated Shidduch Forum 7/13/18: Picky Parents = Picky Daters? Yated Shidduch Forum 6/29/18: Am I Too Chilled About Dating? Is It Really Okay That We Share Pictures For A Shidduch? Yated Shidduch Forum 6/15/18: Why is the Clothing I Wear on a Date Such a Big Deal? Yated Shidduch Forum 6/8/18: Long Dates & Uncomfortable Venues; Why Must It Be That Way? Yated Shidduch Forum 6/1/18: Should I Be Expecting More? Yated Shidduch Forum 5/18/18: Why is Hashem Doing This to Me? Yated Shidduch Forum 5/11/18: We Gave a Yes, Why is He Delaying? Yated Shidduch Forum 3/30/18: Should Shadchanim be Speaking to the Daters or the Parents? Yated Shidduch Forum 3/16/18: How Important is Emotional Connection? Yated Shidduch Forum 3/9/18: Is it Possible to Change Someone’s Mind About a Shidduch? Yated Shidduch Forum 3/2/18: Bechira, Hishtadlus, & Hashgacha – A Complementary Trio? Yated Shidduch Forum 2/23/18: Purim Edition! Yated Shidduch Forum 2/16/18: Not So Into His Looks, What To Do? Yated Shidduch Forum 2/9/18: Should The Yated Feature Profiles of Singles? Yated Shidduch Forum 2/2/18: Are My Parents Being Too Picky? Yated Shidduch Forum 1/26/18: How Much Information Do I Have to Give About Money? Yated Shidduch Forum 1/19/18: How Do I Prevent My Shidduch Profile References From Doing More Harm Than Good? Yated Shidduch Forum 1/12/18: Unfair Stereotyping? Yated Shidduch Forum 1/5/18: Where is the “Thank You”? Yated Shidduch Forum 12/29/17: Have Single Women Become Complacent in Shidduchim? Yated Shidduch Forum 12/22/17: Am I Too Worldly? Yated Shidduch Forum 12/15/17: Do We Have to Give a Reason for Saying “No”? Yated Shidduch Forum 11/17/17: Wrong to be Looking for the “Best Guy”? Yated Shidduch Forum 11/3/17: Can I Change My Mind After Saying Yes? Yated Shidduch Forum 10/20/17: Using a Coupon on a Date; Waive It or Save It? Yated Shidduch Forum 9/29/17: Are Singles Properly Prepared for Rejection? Yated Shidduch Forum 9/15/17: Redd to a Divorcee for the First Time, How to Approach? Yated Shidduch Forum 9/1/17: “Rowdy” in High School But Still a “Gem”? Yated Shidduch Forum 8/25/17: Concern’s with Kashrus? Yated Shidduch Forum 8/11/17: The Shidduch Didn’t Work Out, is it Still Safe to Say Hello? Yated Shidduch Forum 8/4/17: New Rules & Regulations for Shadchanim? Yated Shidduch Forum 7/21/17: Will My Son’s In-Laws Respect His Learning in Kollel? Yated Shidduch Forum 7/14/17: Why Can’t I Ride My Bike? Yated Shidduch Forum 7/7/17: Is a Second Date Worthwhile Even for Experienced Daters? Yated Shidduch Forum 6/30/17: Testing the Dating Waters? Yated Shidduch Forum 6/23/17: Should a Rov be a Shadchan? Yated Shidduch Forum 6/16/16: What Do We Need to Know From Our Son After a Date? Yated Shidduch Forum 6/9/17: Long Dating Saga’s – How Long To Keep At It? Yated Shidduch Forum 5/19/17: Grandparent’s Getting In The Way? Yated Shidduch Forum 5/12/17: What’s the Rush?! Yated Shidduch Forum 5/5/17: Is He Lacking Seriousness? Yated Shidduch Forum 4/28/17: Why Doesn’t He Have a Rebbi? Yated Shidduch Forum 4/7/17: How Do I Prepare My Son For Shidduchim?